Portuguese knitting style uses pins or brooches to help guide the yarn to the needles and uses a different way of knitting to the classic Continental or English styles of knitting. This type of knitting is also known as Turkish, Bosnian, Peruvian or Andean Knitting. 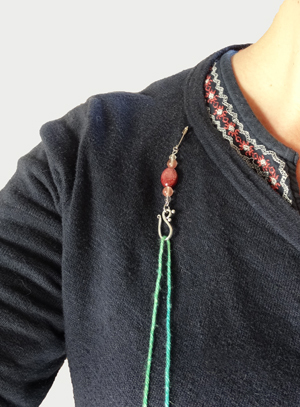 To use this style, a Portuguese knitting pin is needed to guide the yarn by clipping the pin to your shoulder, feeding the yarn through the hooked end. Knitting in this style has several benefits, not least it can help if you suffer from arthritis in the hands and/or carpal tunnel by limiting the movements that your hands make whilst knitting. It can help with colourwork using several strands of yarn and also with evening out yarn tension. 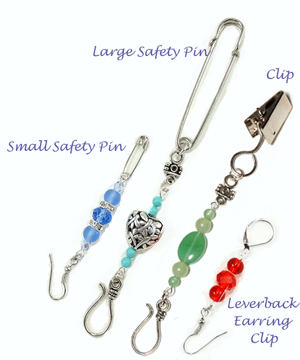 With a choice of clips, for each pin.